There are an estimated 13.4 million Jews on the earth today. Many are found in America , approximately 6.5 million. A little over 5.8 million are in the land of Israel. Wonderful prophecy has been fulfilled when the Jewish nation of Israel was re-established in 1948. Amos 9:14, 15 And I will bring again the captivity of my people of Israel , and they shall build the waste cities, and inhabit them ; and they shall plant vineyards, and drink the wine thereof; they shall also make gardens, and eat the fruit of them. And I will plant them upon their land, and they shall no more be pulled up out of their land which I have given them, saith the LORD thy God. Eze 4:4-6 KJVA Lie thou also upon thy left side, and lay the iniquity of the house of Israel upon it: according to the number of the days that thou shalt lie upon it thou shalt bear their iniquity. (5) For I have laid upon thee the years of their iniquity, according to the number of the days, three hundred and ninety days: so shalt thou bear the iniquity of the house of Israel. (6) And when thou hast accomplished them, lie again on thy right side, and thou shalt bear the iniquity of the house of Judah forty days: I have appointed thee each day for a year. Ezekiel said the Jews were to be punished for 430 years because they had turned away from God. As part of the punishment, the Jews lost control of their homeland to Babylon. Many Jews were taken as captives to Babylon. Babylon was later conquered by Cyrus in 539 BC. Cyrus allowed the Jews to leave Babylon and to return to their homeland. God told the Jews to go back to the land of Israel but most refused. They liked Babylon. Only a small number returned. The return had taken place in 537 BC, about 70 years after Judah lost independence to Babylon. Because most of the exiles chose to stay in pagan Babylon rather than return to the Holy Land, the remaining 360 years of their punishment was multiplied by 7. The reason is explained in the book of Leviticus. ( Leviticus 26:18 , 26:21 , 26:24 and 26:28 ). In Leviticus, it says that if the people did not repent while being punished, the punishment would be multiplied by 7. And, by staying in pagan Babylon, most exiles were refusing to repent. However, when the people of Israel refused to repent of their sins, this punishment was multiplied seven-fold from 360 years to 2,520 years. 360 days comprise a biblical year, so the allotted time equaled 907,200 days. (2,520 x 360). Subtracting 907,200 days from the Gregorian date of May 14, 1948, the day Israel became a nation again, the calculator reveals a date of July 15, 537 B.C which is the exact date that Cyrus gave the decree for them to leave! The Bible is amazingly accurate to the day!!! Another proof of the supernatural nature of the Bible.We are seeing the prophecies of the Bible unfold right before our eyes. This is why we study prophecy; to see God’s Word come to pass and rejoice at the time we live in. Gen 13:14 And the LORD said unto Abram, after that Lot was separated from him, Lift up now thine eyes, and look from the place where thou art northward, and southward, and eastward, and westward: For all the land which thou seest, to thee will I give it, and to thy seed forever. Gen 17:8 And I will give unto thee, and to thy seed after thee, the land wherein thou art a stranger, all the land of Canaan , for an everlasting possession; and I will be their God. Deu 11:24 Every place whereon the soles of your feet shall tread shall be yours: from the wilderness and Lebanon , from the river, the river Euphrates , even unto the uttermost sea shall your coast be. (Larkin, Clarence. 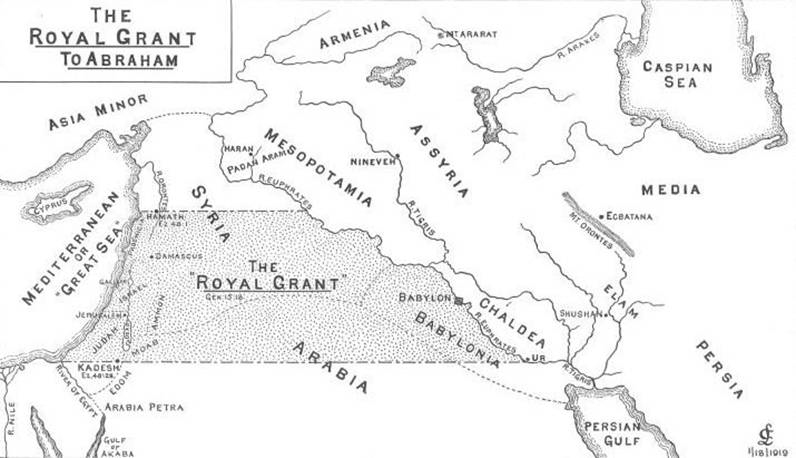 “The Royal Grant to Abraham,” The Book of Revelation . Blue Letter Bible. 1 Apr 2002. 7 Sep 2005. Jer 30:3 – 7 For, lo, the days come, saith the LORD, that I will bring again the captivity of my people Israel and Judah (*i.e. bring them out of captivity), saith the LORD: and I will cause them to return to the land that I gave to their fathers, and they shall possess it. And these are the words that the LORD spoke concerning Israel and concerning Judah . For thus saith the LORD; We have heard a voice of trembling, of fear, and not of peace (*possibly terrorism). Ask ye now, and see whether a man doth travail with child? wherefore do I see every man with his hands on his loins, as a woman in travail, and all faces are turned into paleness (*reminds me of the Wailing Wall in Jerusalem )? Alas! for that day is great, so that none is like it: it is even the time of Jacob’s trouble ; but he shall be saved out of it. *The Parenthetical statements are mine. We Christians need to love the Jews and pray for them earnestly that more will hear the Gospel so that they can be saved and that they will heed the words of Jesus in Matthew 24 and flee when they see the abomination of desolation. Act 13:44 – 48 And the next sabbath day came almost the whole city together to hear the word of God. But when the Jews saw the multitudes, they were filled with envy, and spake against those things which were spoken by Paul, contradicting and blaspheming. Then Paul and Barnabas waxed bold, and said, It was necessary that the word of God should first have been spoken to you: but seeing ye put it from you, and judge yourselves unworthy of everlasting life, lo, we turn to the Gentiles. For so hath the Lord commanded us, saying, I have set thee to be a light of the Gentiles, that thou shouldest be for salvation unto the ends of the earth. And when the Gentiles heard this, they were glad, and glorified the word of the Lord: and as many as were ordained to eternal life believed. Mat 8:10 When Jesus heard it, he marveled, and said to them that followed, Verily I say unto you, I have not found so great faith, no, not in Israel. Act 1:9 And when he had spoken these things, while they beheld, he (Jesus) was taken up; and a cloud received him out of their sight. Act 1:11 Which also said, Ye men of Galilee , why stand ye gazing up into heaven ? this same Jesus, which is taken up from you into heaven, shall so come in like manner as ye have seen him go into heaven. Jesus will come back again with ten thousands of His saints and angels in a cloud, not as a man walking the earth leading nations with politics and religion. If you are unsure that you would make the rapture or you would go to Heaven if you died tonight, click here and contact me to find the only way to God as the Bible proclaims. Mat 28:18 – 20 And Jesus came and spake unto them, saying, All power is given unto me in heaven and in earth. Go ye therefore, and teach all nations, baptizing them in the name of the Father, and of the Son, and of the Holy Ghost: Teaching them to observe all things whatsoever I have commanded you: and, lo, I am with you always, even unto the end of the world. Amen. The Church looks forward to when the Lord Jesus will shout from heaven and a trumpet blast (probably a shofar) will be heard and we shall fly up to meet Him in the air. Until then, we are working hard to bring the Gospel to the nations for when we leave, for a time, no one will be able to tell the Gospel story.